What happens when the government tells us that something is safe, supports sanctions increasing our exposure, and then the overwhelming weight of scientific evidence begins to loom like a flashing neon sign? It should, because it is what has happened with our industrial chemical exposures, with vaccination, and with pesticides, to name a few examples. It's called cognitive dissonance: the distress that should be experienced when faced simultaneously with two contradictory statements. We are expected, as citizens, however, to slip comfortably into a conformist haze. No questions. No dissent. No room for outrage that the fox guarding our hen house has been systematically digging a hole so that his entire pack can sneak in without warning. 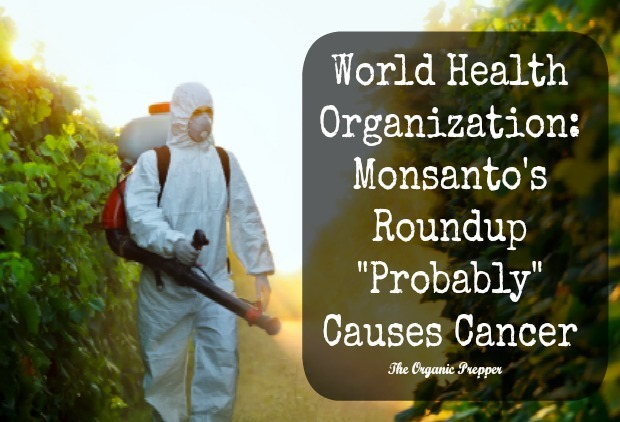 In March of this year, 17 experts from 11 countries met at the WHO's International Agency for Research on Cancer to discuss the cancer-causing effects of organophosphate pesticides including glyphosate, the active ingredient (but only one of many) in Monsanto's Roundup. Glyphosate, used in more than 750 products, and ever more so because of its role in the production of genetically modified crops such as soy, canola, and corn, is now present in our air, water, and soil. DespiteSeralini et al. 's evidence for dramatic oncologic processes manifes..., scant trials have been done. This is because the dilutional effect of post-marketing injury, chronic disease, and death allows for all of the chemical exposures to hide under a large blanket of denial. Pharma, Big Ag, and Big Chem all get to say, "it wasn't me" while no one is conducting the most basic research to substantiate these claims, and our government turns a blind eye. What data has been amassed supports a signal in rodent studies for pancreatic, kidney, skin, and hemangiosarcoma and for non-Hodgkin's lymphoma based on human case-control studies. Glyphosate and glyphosate formulations induced DNA and chromosomal damage in mammals, and in human and animal cells in vitro. The Working Group classified glyphosate as "probably carcinogenic to humans"
Given what we know of glyphosate's effects on the gut microbiome, its chelation of minerals, its endocrine-disrupting properties, and glutathione-depletion, this is no surprise. Distrustful of a presiding agency with a self-proclaimed interest in public health, I am left to wonder what the pronouncement of this information is in the service of. The EPA has known since the 1980s that Roundup is cytotoxic, particularly to kidneys, and has obfuscated. Why is this information coming out now, and what will be done with it? What you can do, while this all shakes out, is continue to stand up for your right to know what is in your food, to demand that Roundup be banned as the only reasonable extension of the precautionary principal. You can eliminate the major suspects from your diet - soy, corn, canola, beet sugar - and buy organic, biodynamic, and local. The more of us who say no, the harder it will be to drown us out. Dr. Brogan is boarded in Psychiatry/Psychosomatic Medicine/Reproductive Psychiatry and Integrative Holistic Medicine, and practices Functional Medicine, a root-cause approach to illness as a manifestation of multiple-interrelated systems. After studying Cognitive Neuroscience at M.I.T., and receiving her M.D. from Cornell University, she completed her residency and fellowship at Bellevue/NYU. She is one of the nation’s only physicians with perinatal psychiatric training who takes a holistic evidence-based approach in the care of patients with a focus on environmental medicine and nutrition. She is also a mom of two, and an active supporter of women's birth experience. She is the Medical Director for Fearless Parent, and an advisory board member for GreenMedInfo.com. Visit her website.